The origin of coffee is highly disputed and, as is the case of fine wine, it is shrouded in mystery and romanticism. There are many versions about how this extraordinary drink appeared. The most famous and well-known legend is that of Kaldi, an Ethiopian monk. 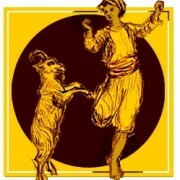 It is believed that this monk discovered Arabica coffee beans (indigenous to Ethiopia), when he found his goats dancing like mad, after having eaten the beans found in a bush. He tried these berries and he was happy to discover their energizing effects. Soon, coffee became a religious ceremonial drink that helped the monks to stay awake during lengthy prayer hours at night. The coffee first appeared in a manner similar to tea today. Coffee plant leaves were boiled in water and the resulting liquid was drunk as it was. This brewing technique gave a use to coffee beans, which were then fried before cooking. Coffee shrubs grow at altitudes ranging between sea level and 2000m. In terms of global positioning, they are located between the Tropic of Cancer and the Tropic of Capricorn. Each region produces coffee with a distinct flavor and aroma. Coffee is grown in over 50 countries, but although there are over 50 species of coffee plants, only two species are traded, Arabica and Robusta. Arabica accounts for 75% of world production of coffee. Normally, it is cultivated on high mountain plateaus at altitudes between 1000m and 2000m. 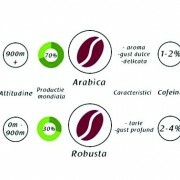 Robusta, which is of a lower quality, grows at lower altitudes, between sea level and 1000m. Arabica shrubs reach maturity after 5 years of cultivation and can be picked up not more than twice a year. On the other hand, Robusta shrubs reach maturity in just two years and can be collected 4 times a year. 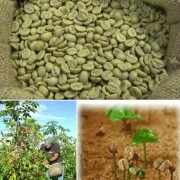 Robusta is more resistant, bears more fruit, is more resistant to disease and has a higher yield. For these reasons, Robusta coffee is the most commonly used and the cheapest. Many supermarket coffee varieties use a blend of Robusta and Arabica beans. In this way, costs are kept at a low level, but the coffee is of a poorer quality. Gloria Jean’s coffee is made from Arabica beans only, 2% of the best Arabica beans grown worldwide.